Bob Dimmitt, a geotechnical engineer of the U.S. Corps of Engineers Kansas City District, right, explains a recently assigned safety rating of Pomona dam to Jim Green, Pomona, during an open house last week at the project office. POMONA LAKE—The dam at Pomona Lake is significantly inadequate with moderate to high risk, but nobody downstream should worry. 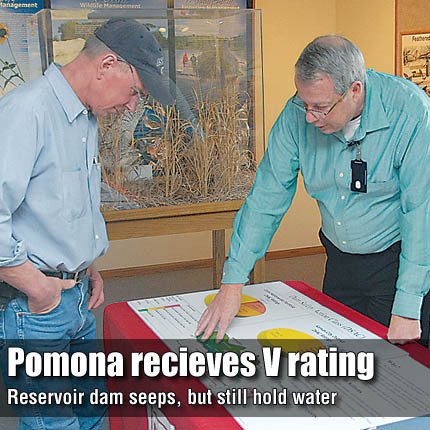 The official dam safety classification was released last week during an open house at the Pomona Lake project office. As explained at the open house March 2, the U.S. Army Corps of Engineers implemented a national program for evaluating dams’ risks nationwide. Based on screening results, dams were rated according to the Dam Safety Action Classification system on a I to V classification. Normal and adequately safe dams are represented by a V rating; I is a dam that is critically near failure or extremely high risk. Pomona Lake dam is rated as III, meaning it is significantly inadequate or moderate to high risk. The one-day inspection was conducted in April 2009 by a team of experts. According to the Corps, the results of the inspections of more than 600 dams nationwide will be used to prioritize dam rehabilitation funding. “We want to put money where the dams are most at risk,” said Bob Dimmitt, a geotechnical engineer of the Corps’ Kansas City District. Dimmitt said that although the inspection of Pomona dam resulted in identified concerns, the dam is not in danger of breach, and it will continue to serve its purposes for many years. The identified concerns are: Foundation rock is jointed and may have small cavities that allow seepage during high pool; rip rap on the dam face is weathered and degraded that could result in erosion during extreme floods; and the dam has less drainage features than newer dams, resulting in more concerns about stability and seepage. Dimmitt said Pomona dam has a known seep on the left abutment that is monitored daily. Following the inspections, the Corps has budgeted for work at Pomona Lake, including measuring seepage, surveying the drainage, updating emergency action plans, scheduling coordination meetings with emergency management officials, and public communication. Dimmitt said on-site personnel inspect the dam daily looking for unusual or changed conditions. More thorough inspections are conducted monthly. In addition to annual inspections, Pomona dam is also scheduled for a detailed five-year inspection in October. The only other Kansas Corps dam to be rated as III was at Wilson Lake. The primary concern at Wilson is seepage. Nearby Melvern Lake dam was one of seven Kansas Corps dams rated as IV, or inadequate with low risk or moderately safe. No risk reduction measures are required for dams rated IV. According to Dimmitt, the highest or safest rating of V applies primarily to newly constructed dams and no dams in Kansas have that rating.